Save $400 per couple off American Cruise Lines departures when you book nine months in advance. Click here for eligible departures. Receive one free hotel night before your cruise with American Cruise Lines, plus transfers to your ship on the day of departure when you book one month in advance. Click here for eligible departures. Receive free shore excursions on this river cruise. Click here for eligible departures. Enjoy a free open-bar cocktail hour every evening before dinner. Click here for eligible departures. St. Paul is a thrilling place to end your adventure as Minnesota’s must see capital! History buffs will enjoy a walking tour of Summit Avenue, which showcases gorgeous historic mansions built in the late 1800’s. St. Paul’s enchanting art galleries, world class museums, and entertaining stage performances will be sure to capture your imagination. End the day by visiting Mounds Park, where visitors are treated to a beautiful panoramic view of the city. Nestled among the scenic bluffs of the upper Mississippi River, Red Wing's beauty has inspired artisans, craftspeople and artists for over 150 years. Red Wing delivers a diverse blend of arts, entertainment and activities for your pleasure. Enjoy a show at Red Wing’s historic Sheldon Performing Arts Theatre or observe the beauty of nature in one of Red Wing’s 38 parks. Step into 19th Century America in La Crosse, located on the banks of three captivating rivers. Discover the heart of the Amish Country, where transportation is provided on horse and buggy. La Crosse is also home to Riverside Park, where you’ll enjoy beautiful gardens, an outdoor performance center, and inspiring sculptures. Winona is one of the most beautiful places in the country, nestled between the covered limestone river bluffs that rise 500 feet and the stunning mighty Mississippi River. 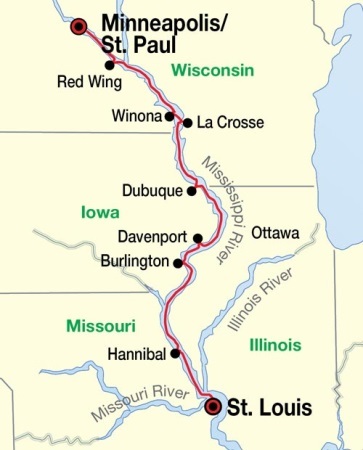 The town was named for Princess We-Noh-Nah, daughter of Chief Wapasha (Wabasha) III. When translated, it means "first-born daughter." Today it enjoys the motto of the “Island City.” Be sure to visit all the wonders of Winona, including the Winona Country Historical Society Armory Museum, St. Stanislaus Koska Catholic Church, and the Watkins Country Heritage Museum. A “Masterpiece on the Mississippi,” Dubuque is Iowa’s oldest city and is among the oldest settlements west of the Mississippi River. Dubuque is overflowing with things to do and see. Take a ride on the Fenelon Place Elevator, the world’s shortest and steepest scenic railway or try your luck in one of Dubuque's state-of-the-art casinos. View colorful Victorian mansions, stroll through a whimsical downtown area, and visit the national Mississippi River Museum and Aquarium. No matter what you’re interested in, Dubuque has it! Voted one of the Most Livable Small Cities in America, Davenport is often described by newcomers and life-long residents alike as having incredibly friendly people living in a city large enough to have plenty of things to do while still retaining a hometown feel. This vibrant city features the Legacy of John Deere, the largest agricultural exhibit in the world. Music enthusiasts will enjoy partaking in Davenport’s many music festivals, including the Mississippi Valley Blues Festival, The Mississippi Valley Fair, and the Bix Beiderbecke Memorial Jazz Festival, which is dedicated to native Bix Beiderbecke. The ancestral home of the Sauk Indians, Burlington resounds with the myths and memories of their past. Enjoy a tour of Historic Fort Madison, where you’ll learn about life in the first military fort built on the Upper Mississippi from costumed interpreters, or explore Historic Nauvoo, an early Mormon settlement. Hannibal, “America’s Hometown,” is a place where you can re-discover the adventures from Mark Twain’s era. The spirits of Tom Sawyer and Huck Finn are alive in this charming Missouri town, where you can run your hand along Aunt Polly’s fence, explore Injun Joe’s Cave, and get reacquainted with one of the world’s most beloved authors. The downtown area is a thriving haven for artisans filled with wonderful and special shops that are unique to Hannibal. No matter what you choose to do, you will find this town to be very accommodating. St. Louis, known as the “Gateway to the West,” is sure to win you over. Take in the Gateway Arch Riverfront, highlighted by the majestic Gateway Arch, which is the largest man made monument in the U.S. There’s something for everyone at St. Louis’ many world-class, free attractions, including the Art Museum, Science Center, Anheuser-Busch Brewery, and the Missouri History Museum. You can end your day by relaxing at the Missouri Botanical Garden, one of the world’s top public gardens. The dramatic landscapes of the Upper Mississippi River have long inspired artists, writers, and steamboat passengers. It was here that literary great Mark Twain used the majestic river and its scenic bluffs as the settings in his most popular works. Visit his boyhood home in Hannibal, where the characters of Huck Finn, Tom Sawyer, and Becky Thatcher come to life. Explore the beautiful gardens and historic homes of La Crosse. Get close to nature in Red Wing as you witness a variety of bald eagle nests. Enjoy a guided tour of the Black Hawk State Historic Site which celebrates the story of the Sauk and Meskwaki Indians who once called Davenport home. Dining service, snacks and complimentary cocktail parties. Oversized staterooms – largest in industry. Flat screen satellite TV and DVD players in all staterooms. Individual climate control in all staterooms. Itinerary is subject to change. Fares do not include port charges.